January 17, 2019, 2:00 p.m. In a repeat of last year, figures from YouGov Plan & Track reveal that current customers of T-Mobile reported higher satisfaction with their wireless carrier in 2018 than customers of Verizon, AT&T, or Sprint showed for their respective provider. When asked if they&apos;d consider themselves either a satisfied or dissatisfied customer, T-Mobile subscribers gave the brand an average score of 75 on a scale ranging from -100 to +100 throughout the past year. 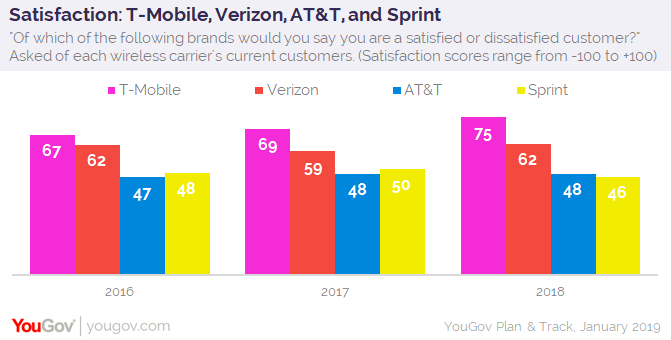 Verizon came in second place with a Satisfaction score of 62 among its current customers, followed by AT&T with 48 and Sprint with 46. A look back to the beginning of 2016 indicates that T-Mobile has also experienced the most growth in customer satisfaction. Numbers show that the brand climbed from a Satisfaction score of 67 in 2016, to 69 in 2017, to 75 in 2018. The nation’s other three leading wireless carriers, by comparison, have remained relatively flat throughout the same time period. 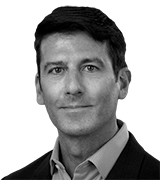 A key metric that’s likely related to T-Mobile’s increase in customer satisfaction is Quality. Asked whether they think T-Mobile represents either good or poor quality, current customers of the brand gave it a Quality score of 57 in 2016, followed by 61 in 2017 and 68 in 2018. This past year, T-Mobile surpassed Verizon to claim the top spot in perceived quality among its own particular customer base. 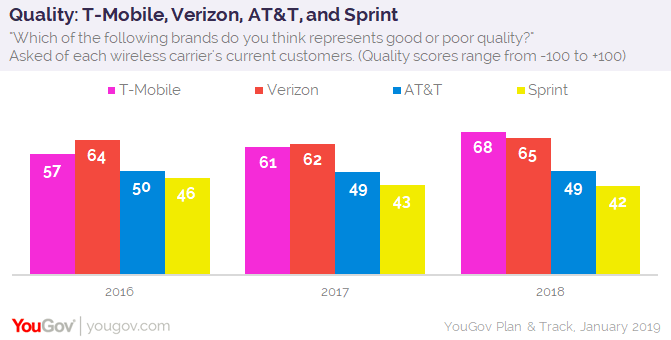 AT&T’s Quality score has remained fairly stable over the past three years, while Sprint’s has seen a slight decrease. At present, 72% of T-Mobile customers say the internet is their main source of information, compared to 64% of the general public. At the same time, 47% of T-Mobile subscribers admit that their phone battery never lasts the whole day without charging it, compared to 42% of all US adults.